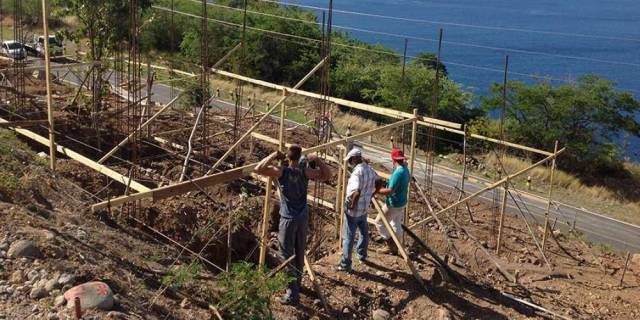 (Adventist Review) Seventh-day Adventist volunteers are building new homes for families who lost everything when a deadly tropical storm ripped through the small Caribbean island of Dominica last year. The Dominica branch of the Adventist Development and Relief Agency is overseeing the rebuilding efforts as two teams comprised of 50 Adventist volunteers each take turns traveling to the island for one-week assignments from the U.S. Virgin Islands and nine neighboring islands. “ADRA is making good on its promise to assist the government with housing for the displaced,” said Priscilla Prevost, the local ADRA project coordinator. ADRA began discussions with the government to assist in building homes just days after Tropical Storm Erika devastated the island of about 72,000 people on Aug. 27, killing more than 30 people, including an Adventist believer. The storm triggered mudslides and destroyed roads, bridges, and homes. Prevost said ADRA and the volunteers have begun construction of three three-bedroom homes and five two-bedroom homes. ADRA expects to complete the first three homes in April and five more by July. In all, 25 homes will be built over the next year. “The government is providing the land and infrastructure and ADRA is providing labor and funds,” Prevost said. Dominica’s prime minister, Roosevelt Skerrit, visited Adventist volunteers at a construction site in late January and thanked them for their work. Silton Browne, president of the Adventist Church’s North Caribbean Conference, which is supplying many of the volunteers, said church members had no option but to help. Adventist volunteers sprang to help in the aftermath of the storm, with ADRA provided daily meals to about 120 people in two shelters. Erika also sent shockwaves through the Adventist community, which scrambled to assist all those affected by the tragedy. In addition to the church member’s death, 10 Adventists lost their homes, and two Adventist Church-owned buildings suffered flood damage: a grade school in the capital, Roseau, and a church building in the west coast village of Dublanc. Five months later, 373 families remain affected by the storm, Prevost said. Herman Ravariere, who leads a volunteer building team and serves as elder of the Peter’s Rest Seventh-day Adventist Church on St. Croix, said he was glad that he could help with the new homes. “We think Dominica is a great place, and we’re glad that we can help a little bit,” he said.